To configure the visual effects in Windows 7, you need to use the Performance Options dialog box that you open from the System Properties dialog box. There are multiple ways to open the System Properties dialog box. The following 2 methods will show you how to do this both from the dialog box’s actual location and via a shortcut. Method 1 – System Properties Location. 3 – Click on System and Security. 4 – Click on System. 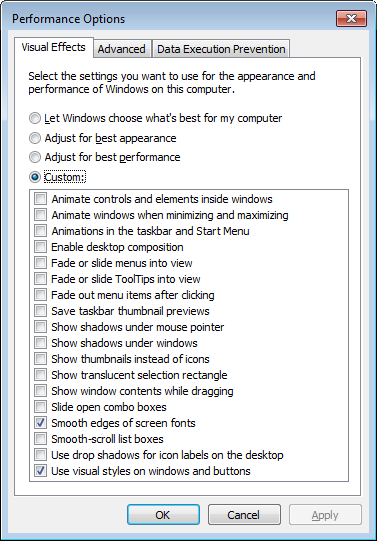 5 – Click on Advanced system settings from the left hand pane. 2 – Type “system env” from the Start Menu search box. 3 – Click on Edit the system environment variables. To open the Performance Options dialog box, make sure you’re on the Advanced tab in the System Properties dialog box and then click on the Settings buttons under the Performance section. The Visual Effects tab allows you to optimize the visual effects for the menus, toolbars, windows and the taskbar in Windows 7. The more effects that are enabled, the more resources your computer will use. 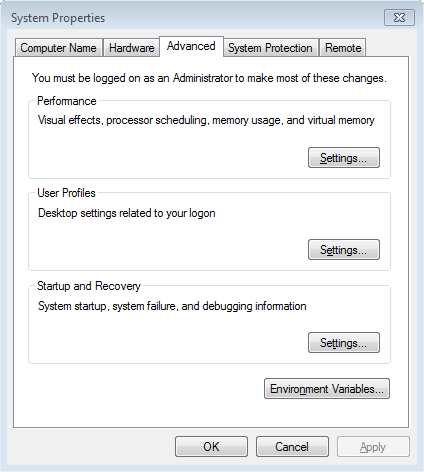 1 – Let Windows choose what’s best for my computer – lets Windows 7 decide on the your settings based on the hardward configuration on the computer. 2 – Adjust for best appearance – will enable all the visual effects for all the graphical interfaces. 3 – Adjust for best performance – will disbaled all the visual effects for all the graphical interfaces. 4 – Custom – lets you decide which of the availbe options to enable or disable. I cannot tell you which the best confiuration to use is because it is down to personal preference. As you can see from the screenshot above, I’ve choosen to use the Custom option and only enabled the following 2 settings – use visual styles on windows and buttons, and smooth edges for screen fonts. The reason I went for these settings is because I’m not interested in all the gimmicks and visual effects that comes with Windows 7. I’m more interested in getting better performance. Play around with the different settings and see what works best for you.